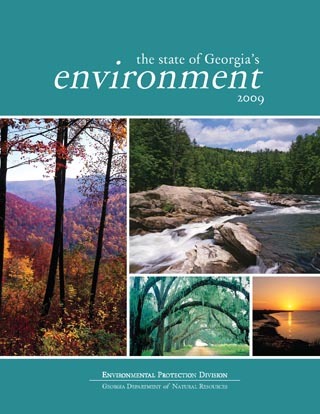 The Environmental Protection Division (EPD) of the Georgia Department of Natural Resources is pleased to present, "The State of Georgia’s Environment," published in 2009. This report contains up-to-date information on what we know, and don’t know, about the current condition of our water, land and air resources. The report presents a series of environmental indicators related to protecting human health, sustaining healthy ecosystems, and supporting a growing economy. It discusses the environmental challenges that Georgians will face in the coming years and highlights actions that will lead to better environmental conditions while supporting the state’s economy and Georgians’ quality of life. EPD is offering the report in PDF format for downloading and printing in its entirety, but please know that this is a large file (5MB) and downloading may take a significant amount of time. To download this report as a single complete PDF file, right-click the link below and select "Save Target As" or "Save Link As" to save the complete report to your computer. The report also is offered for downloading and printing in sections (PDF) as listed in the Table of Contents. Click on the headings below to view, print, and save this material to your computer.